Bali vacations would be a great adventure for you in this island of beautiful green carpet of paddy fields and the lovely culture. Tropical paradise, that's what people find about this island with great amount of bali beach resort. It is not difficult to looking for some resort. They are everywhere. The childlike innocence of the people, the culture, the temple, and the dance. That's make this island so popular. Many people come to Indonesia just to visit this island, and never leave it. And not to forget the beautiful bali beaches, so magnificent. Just visit the right place and you'll find the heart of this island of God. You don't want to miss the opportunity to know better about this beautiful and significant island. And not to speaking about the mountains, spread all over the island, just truly breathtaking. Discover the extraordinary people and culture. The most common sight through this island is the green lush carpet of rice paddy field. They are very beautiful sight. Rice is also the main income and the staple food of the people. This island is probably the best rice growers in the world. Balinese people are nominally Hindu's. They have strong religious belief and active cultural life. They belief that the spirits are everywhere. They make offers for their Hindu's God like Brahma, Shiva and Vishnu. You can see this strong religion in the whole island by their temples, they are truly everywhere. Every village has several and every home has at least a simple house temple. Ceremonies and festivals are an important part of their life. The first ceremony of life takes place at the third month of pregnancy. Offerings are made at home and at the village river or spring to ensure the wellbeing of the baby. So every stage in life circle has its ritual. Even funeral is an ceremony, an amazing, colourful, noisy, exciting, and happy occasion. It represent the destruction of the body and the release of the soul so that it can be united with the supreme God. For much of the year, the temples are deserted and empty place. But on the holy days the bali temples comes alive with days of activity and nights with drama and dance. The full moon periods around the end of September to early October or early to mid April are often the time for important festivals. One of such festival is The Galungan, which take place throughout the island. They also very famous with their gracious dances, click here for more info about Balinese dance. And not to forget, the tropical bali beaches, very known all over the world. The beaches are beautiful, some of them are very commercial like Kuta, but some of them are quiet and lovely. East Bali It's a challenge to discover this part of the island with many fabulous places to explore where volcano and beaches comes together. West Bali explore the most beautiful places of this island like Tanah Lot, the jungle of West Bali National park, or beautiful beach at Mendewi. North Bali This is absolutely the perfect area to relax, with the beautiful beaches, hidden villages, and great places to do snorkeling and diving. So there is a lot to find out about this lovely island , you will need at least a few weeks to explore it. 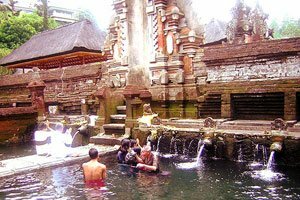 Bali vacations would be one of the great adventure in your life with many things to do in Bali. Looking for exclusive deals to make your round trip to Bali? Check out this site Air Canada flights with One travel. If you’re intend to flight from USA or Canada, it’s certainly one of the best choice. It’s easy to looking for the lowest rate.Save Big on your air tickets at OneTravel.com. We are very blessed that we're living in a beautiful earth with so much beauty around us and there is a lot more tropical beach in the world that ready to explore like Maldive island located on the equator, south west of Srilanka, a very beautiful place. Maybe you would like to consider this island as your next holiday destination. Would you like to know more about this island, click here, this web site has an A to Z of resort islands, with telephone numbers and links to resort web sites, scuba diving information/Manta Ray migration, geography, history and much more.